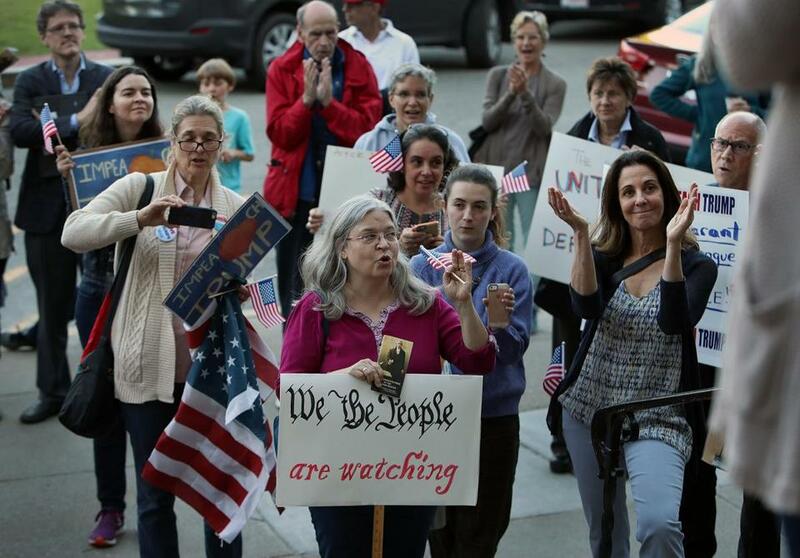 A crowd supporting the impeachment resolution rallied outside Newton City Hall. NEWTON — More than 100 people called for the impeachment of President Trump at a rally Wednesday outside Newton City Hall, ahead of a hearing by city councilors on whether to back a congressional probe of the president. “The president has aggressively used the power of the presidency to enrich himself, his family members, his associates at the expense of the public,” said Newton resident Ben Clements, who urged councilors to support the nonbinding resolution as part of the national Impeach Trump Now campaign. Ten municipalities across the nation — from tiny Charlotte, Vt., to sprawling Los Angeles — have already demanded an investigation into whether Trump should be impeached. Similar resolutions have passed in Brookline, Cambridge, Amherst, Pelham, and Leverett. In Newton, a council subcommittee decided Wednesday to move the proposal to a vote of the full city council on Monday, June 19. If approved, the measure would call on Congress to investigate Trump for obstruction of justice, and violations of the foreign emoluments and domestic emoluments clauses of the United States Constitution. The emoluments clause forbids federal office holders from accepting gifts or money from a foreign power. Vicky Gifford, who backed the resolution, carried a United States flag with her into the council chambers before the hearing. She said she wasn’t politically active when she cast a vote for Hillary Clinton last November. But Gifford said she is concerned that President Trump’s conduct in office has sown distrust in the nation’s government and partisanship in decision-making. During the rally, Robert Cohen said the city should back the measure to send a clear signal to the state’s congressional delegation. Livia Imada worked the crowd during the rally, handing out pocket-sized copies of the Constitution to the crowd. She said she’s worried that if Trump isn’t removed from office, future leaders will not respect the Constitution. But some people at the public hearing argued that the city shouldn’t be involved with the issue — and that petitioners had failed to make a case against Trump. Virginia Gardner said that local officials should focus on managing local city business. If the measure is approved, she said the city should maintain a document with signatures of residents who opposed it. Calls for Trump’s impeachment have extended into the city’s race for mayor, as mayoral candidates Ruthanne Fuller and Amy Sangiolo were among the city councilors who backed the measure Wednesday. The proposed measure also has the support of Mayor Setti Warren, a Democratic candidate for governor, a spokeswoman said Wednesday. The national Impeach Trump Now campaign — billed as a collaboration between Free Speech For People and RootsAction — provides a draft version of a resolution that can be submitted to local city governments as a citizen’s petition. Clements, who serves as chairman of the board for Free Speech For People, has called the Trump administration a “for-profit presidency” and said Trump has engaged in efforts to obstruct criminal investigations. While the proposed resolution in Newton is symbolic, the measure would be another public rebuke from local governments to a president in office for less than six months. If the resolution is passed in Newton, it would be sent to US Representative Joseph P. Kennedy III, but is nonbinding and would not require any action on his part. Despite being nonbinding, the resolutions passed by Massachusetts municipalities could signal to the state’s all-Democrat Congressional delegation that there is public support for stronger positions against Trump, said Paul Musgrave, an assistant professor of political science at the University of Massachusetts at Amherst. “It may stiffen some spines in the Democratic party,” Musgrave said.